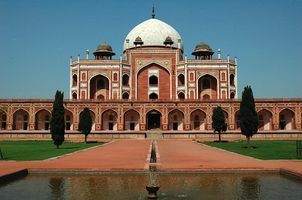 Humayun is the second Mughal emperor, the dynasty ruling North India from the sixteenth to the nineteenth century. He is the great-grandfather of Shah Jahan, the builder of the Taj Mahal. Heir to a new and particularly unstable empire, he will have to fight two successive rebellions, lose his throne and will be able to reconstitute his father's empire only after fifteen years of progress, going from battle to battle. He will leave his son a larger Empire than he has received, from Afghanistan to Bengal. Humâyûn was born on March 17, 1508 in Kabul, during a period when his father, Bâbur, was trying to expand his kingdom. He followed him in his wanderings throughout his childhood and, at the age of 18, he was at his side during the battle of Pânipat (1526), a founding battle of the Mughal Empire. Then he participated in the capture of Agra and was sent to pacify the valley of the Ganges, in the far east of the Empire. In 1528 he received the governorate of Badakhshan, a region now straddling between South Tajikistan and North Afghanistan. It is also south of Ferghana, the original kingdom of the dynasty, and east of Kabul, a city that served as a rear base for the conquests of Babur and which represents the starting point of the dynasty. Badakhshan was a bit like the original territory of the Empire. Humâyûn ascends the throne after his father's death in 1530. Since his Empire is not yet stabilized rebellions are close and are triggered very shortly thereafter. He had to face two foci of rebellion: that of Bahâdûr Shâh, Goujerat and that of Sher Shâh Sûrî in Bihar. Goujerat is the most northern region of the west coast of India, bordering Pakistan. Bahâdûr Shâh was the local Sultan and had to face at once the virtues of the conquest of Humâyûn and the attacks of the Portuguese, newcomers from Europe wishing to reign over part of the lands of India to promote trade. Bahâdûr Shâh therefore raised an army and marched towards Delhi. To counter it Humâyûn came to the Kalinjar fortress in 1531 and sieged it until he obtained a large ransom, which enabled him to finance troops for years to come. He then leaves for the second rebel home, Bihar, in the east of the country, near Bengal. There it is Sher Shâh Sûrî who poses a problem. Sher Shâh Sûrî was an Afghan leader who had a great climb. Entering the service of the Sultan of Bihar in 1522 he served Bâbur in 1527 and 1528, which rewarded him by granting him land. Not accommodating himself he goes to conquer Bihar, joins the Sultant of Bengal and founds an independent kingdom. It is at this moment that Humayyun worries about the eastern part of his Empire, nibbled by this former ally. Once the campaign of Goujerat finished he then takes the path of Bihar but instead of going to the capital, Gaur, he believed free, he sieges the city of Chunar, allowing time for his enemy to take Gaur. Humâyûn then took the road to Gaur and laid siege to that city in order to regain his authority over Bihar and then Bengal, but in the meantime Sher Shâh Sûrî went west and conquered various lands within the city. the Mughal Empire, threatening Agra, the capital. As a result, the Emperor retraced his steps, but was defeated at the Battle of Buxar in June 1539. He lost his troops and his harem on this occasion and had to live only on luck. In 1540 he reformed a new army and resumed the leadership of Bihar to fight Sher Shâh Sûrî who eventually created a kingdom over the north-east of India, but the battle that began was lost (1540, Kanauj) . Humayun had to flee, first to Punjab, then to Sindh, the southern region of Pakistan. It was in Sindh that a Humayun time was installed, exiled. His son was born there in 1542. In 1544 he went to Persia to negotiate an army with Shah Tahmasp I, which he granted him. At the head of this army he first took the direction of Kandahar, then Kabul, in the hands of his brother Kâmran. The two brothers took Kabul each twice between 1544 and 1549, the last word coming back to Humâyûn who made his brother's eyes burst. 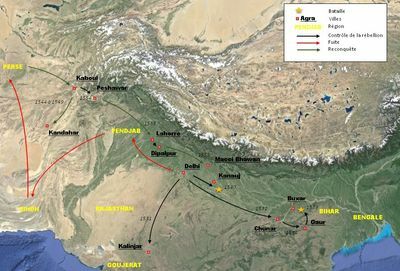 Then begins the reconquest of the Mughal Empire, battle after battle: 1554 (Peshawar), 1555 (Lahore, then Dipalpur and finally Macchi Bhawan). It was this last victory in Macchi Bhawan, against the Afghans, that allowed him to return to the throne of Agra, after 15 years of exile. 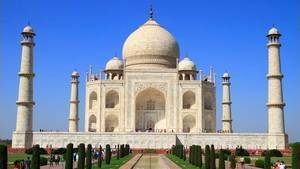 Having managed to reclaim his kingdom he moved to Agra and began to structure the territory. Unfortunately a bad fall made January 27, 1556 took his life. 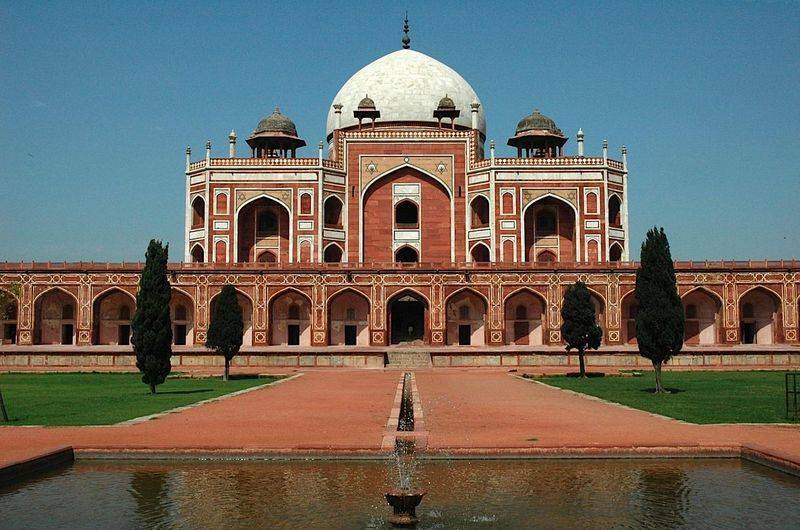 His wife made him build a mausoleum in Delhi, on the Mughal model. 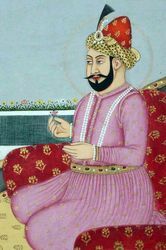 The journeys of Humayun and his father Babur are very similar to the extent that they inherited a territory, enlarged it by military conquests, were exiled and reconquered their territories by force, but died before they could organize the Empire. the successor of Humâyûn, Akbar, inherited a disparate empire, newly conquered and unstable. He also received a tradition of conquest, a nomadic lifestyle and a desire to keep the Empire at all costs. The intangible heritage is more tenuous to the extent that it has not been able to develop the arts, organize daily life or really ruled over its Empire, so make choices that would have marked generations to come. His son Akbar will do it. It should be noted that although he is a Muslim he was neither really practicing nor a preacher, the other religions having been able to practice their cults without any problem. Linguistically, he kept the use of Chaghatai, a language derived from Turkish strongly orientated during the time of his father and his grandfather.